Western blot analysis of extracts from HeLa cells, transfected with 100 nM SignalSilence® Control siRNA (Unconjugated) #6568 (-) or SignalSilence® Atg5 siRNA I (+), using Atg5 Antibody #2630 (upper) or β-Tubulin (9F3) Rabbit mAb #2128 (lower). 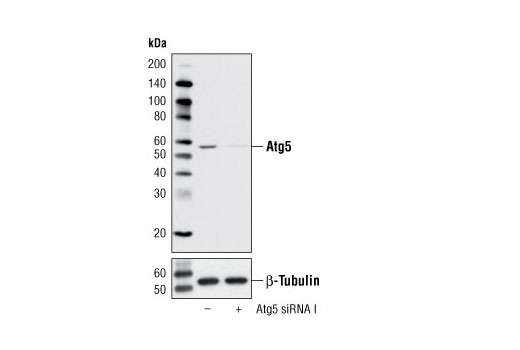 The Atg5 Antibody confirms silencing of Atg5 expression, while the β-Tubulin (9F3) Rabbit mAb is used as a loading control. CST recommends transfection with 100 nM Atg5 siRNA I 48 to 72 hours prior to cell lysis. For transfection procedure, follow protocol provided by the transfection reagent manufacturer. Please feel free to contact CST with any questions on use. SignalSilence® Atg5 siRNA I from Cell Signaling Technology (CST) allows the researcher to specifically inhibit Atg5 expression using RNA interference, a method whereby gene expression can be selectively silenced through the delivery of double stranded RNA molecules into the cell. All SignalSilence® siRNA products from CST are rigorously tested in-house and have been shown to reduce target protein expression by western analysis. Autophagy is a catabolic process for the autophagosomic-lysosomal degradation of bulk cytoplasmic contents (1,2). Autophagy is generally activated by conditions of nutrient deprivation but has also been associated with a number of physiological processes including development, differentiation, neurodegeneration, infection, and cancer (3). The molecular machinery of autophagy was largely discovered in yeast and referred to as autophagy-related (Atg) genes. Formation of the autophagosome involves a ubiquitin-like conjugation system in which Atg12 is covalently bound to Atg5 and targeted to autophagosome vesicles (4-6). This conjugation reaction is mediated by the ubiquitin E1-like enzyme Atg7 and the E2-like enzyme Atg10 (7,8). Tanida, I. et al. (1999) Mol Biol Cell 10, 1367-79. Shintani, T. et al. (1999) EMBO J 18, 5234-41.